As there are many manufacturers of gas bottles and gas cylinders, dimensions may vary significantly. Gas bottle dimensions and weights shown are approximate. 9kg gas cylinder size is the most common size for NZ home BBQ use. 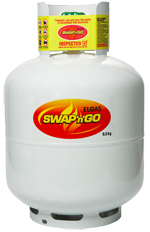 SWAP'n'GO 9kg gas bottleThis is the standard size in our SWAP'n'GO® cylinder exchange program.